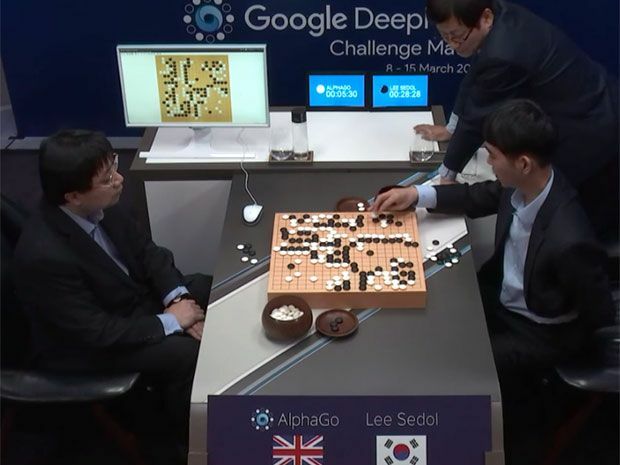 Last night Google’s AI AlphaGo won the first in a five-game series against the world’s best Go player, in Seoul, South Korea. The success comes just five months after a slightly less experienced version of the same program became the first machine to defeat any Go professional by winning five games against the European champion. This victory was far more impressive though because it came at the expense of Lee Sedol, 33, who has dominated the ancient Chinese game for a decade. The European champion, Fan Hui, is ranked only 663rd in the world. And the machine, by all accounts, played a noticeably stronger game than it did back in October, evidence that it has learned much since then. Describing their research in the journal Nature, AlphaGo’s programmers insist that it now studies mostly on its own, tuning its deep neural networks by playing millions of games against itself. The object of Go is to surround and capture territory on a 19-by-19 board; each player alternates to place a lozenge-shaped white or black piece, called a stone, on the intersections of the lines. Unlike in chess, the player of the black stones moves first. The neural networks judge the position, and do so well enough to play a good game. But AlphaGo rises one level further by yoking its networks to a system that generates a “tree” of analysis that represents the many branching possibilities that the game might follow. Because so many moves are possible the branches quickly become an impenetrable thicket, one reason why Go programmers haven’t had the same success as chess programmers when using this “brute force” method alone. Chess has a far lower branching factor than Go. It seems that AlphaGo’s self-improving capability largely explains its quick rise to world mastery. By contrast, chess programs’ brute-force methods required endless fine-tuning by engineers working together with chess masters. That partly explains why programs took nine years to progress from the first defeat of a grandmaster in a single game, back in 1988, to defeating then World Champion Garry Kasparov, in a six-game match, in 1997. Even that crowning achievement—garnered with worldwide acclaim by IBM’s Deep Blue machine—came only on the second attempt. The previous year Deep Blue had managed to win only one game in the match—the first. Kasparov then exploited weaknesses he’d spotted in the computer’s game to win three and draw four subsequent games. Sedol appears to face longer odds of staging a comeback. Unlike Deep Blue, AlphaGo can play numerous games against itself during the 24 hours until Game Two (to be streamed live tonight at 11 pm EST, 4 am GMT). The machine can study ceaselessly, unclouded by worry, ambition, fear, or hope. Sedol, the king of the Go world, must spend much of his time sleeping—if he can. Uneasy lies the head that wears a crown.